Discussion in 'Backcountry' started by Greybeard, Sep 10, 2018. 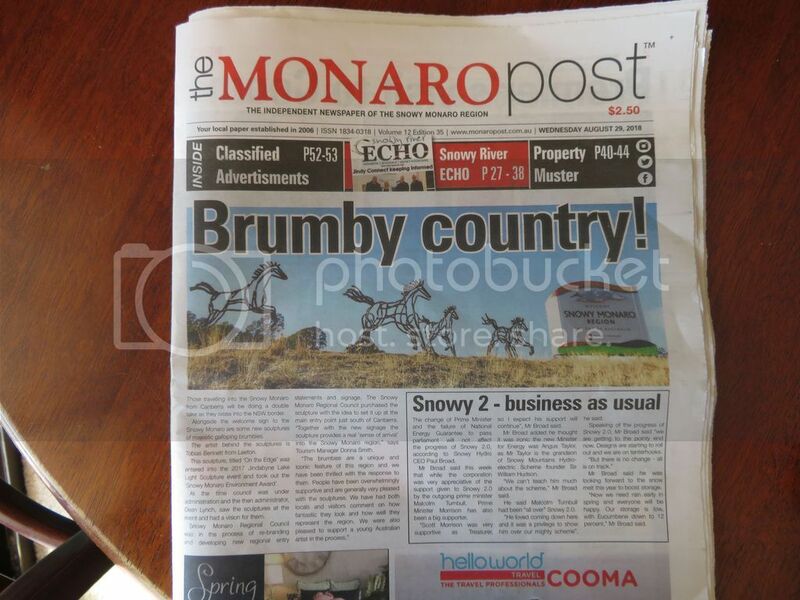 Those travelling from Canberra to Cooma may have noticed, alongside a welcome to Snowy-Monaro region sign, a sculpture of frollicking horses. You may be fascinated to know that this sculpture recently won the "Snowy-Monaro Environment Award". WTF, I kid you not. They may not try that stunt in Wagga Wagga though! Mister Tee on XC Skis and Poppies like this. Thread was not what I expected. nfip, Marty_McSly, PK Sawd and 8 others like this. telecrag and cin like this. Richard and JoeKing like this. But only the good looking ones. I mean, you cant just fk any horse. Dippo, climberman, POW_hungry and 4 others like this. cqen2l, Majikthise and crackson like this. skifree and telecrag like this. Falls Creek Resort were promoting National Threatened Species Day and glorifying photos of feral horses stomping fragile Alpine Environment in the same week. It is all marketing tokenism and political point scoring. Chaeron and Edgecrusher like this. Well it wasn't a black horse! climberman, JoeKing, Kletterer and 1 other person like this. Nice undercling finish. Mr Hill has some great names for climbs. Some strong influence there. crackson and cin like this. JoeKing and cin like this. My favourite sausage in Germany was horse blood and tongue sausage. And you make it sound so appealing! Out of context, of course, said the horse! Majikthise and piolet like this. cin and Telemark Phat like this. The one and only heavyweight ski champion of the world! I can see that one had oats for breakfast. crackson and JoeKing like this. I liked some of the fine beef.. But horse can be nice. Team Bears say it’s impossibke to distinguish feral horses from deer at altitude . Pinnabar right diwn to the Murray close by Tom Grogginess ! That will give the NSW state govt. something consider !! Mister Tee on XC Skis, Chaeron and Bogong like this. Post is useless without pics. Send in our Correspondent MR T to take some happy snaps ! But the way they drive up on the Monaro the sculpture may not have a long life! This is a serious problem for reality going forward, it just reinforces to the ignorant that horses in Oz Wilderness is a good thing in lieu of the reality that they are very destructive. It’s the start of kissing goodbye to any hope of environmental management of feral pests and acceptance of of them into the landscape. Poppies, art, chrisj and 9 others like this. Poppies and VSG like this. How many of the locals want the horses on their own land? Dont farmers love rabbits? Rabbits, brumbies, same same! “On the edge”....a correct title..
On the edge all right.... of serious habitat extinction! We got camels in the Outback, Cane Toads in the tropics. Why should the mountains miss out? Oh that's right, they've got deer. Give it time, the deer will make their way up to the tropics too. Maybe the Parks Vicco gunships can use them as target practice before they hammer the Mt Pinnabar location. .
Watch the sky the Vicco Parks gunships are comming! Shooting deer from the air will be a low carcass rate / $. They spend most of their time under tree cover. If you've ever been off track on Mt Pinnibar and especially the adjoining Hermit Range, you'll know that only a small section is above the tree line while the scrub is the densest I've experienced outside Tasmania. It took us three days of scrub bashing to walk from Tom Groggin to the summit via the Hermit Range and just four hours to walk down via the 4WD road. It would be impossible for a deer shooter to move efficiently through that terrain, so aerial culling is the only realistic option. However the upside of the dense scrub is that it appears to make Pinnibar uninhabitable for horses. Chaeron, Mister Tee on XC Skis and currawong like this. Oh quite low, mostly under 2 metres. But it's tightly packed and often very prickly. What are white people doing in this continent. Didn't you know this whole country and the rest of the world should be black...cause we all came from Africa...right? What were the non-original owners of this land thinking, when they domesticated Dingo's that came from another continent? Why do citizens of all nations have pets? Why is Antartica being colonised? blah f'ing blah. Bloody uncouth country we all choose to live in and all. What are people doing in National Parks across the world...like skiing...get out!